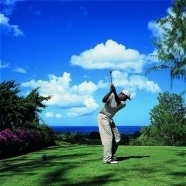 There are 3 courses at Sandy Lane - the Green Monkey, The Country Club Course (with 5 sets of tees) and The Old Nine. If you are planning to golf at Sandy Lane, consider staying at the Sandy Lane Hotel, a classicaly designed coral stone resort, set in a mahogany grove overlooking a sweeping crescent of golden sand and the Caribbean seas. Click here to check availability. The Green Monkey championship course was carved out of a coral-stone quarry and features abrupt elevation changes and panoramic sea views. Named after Barbados' famed Green Monkeys, the course includes a bunker containing a grass island carved in a monkey's shape. The Country Club course features open fairways, five lakes, sea views, and green monkeys who inhabit gullies around the 18-hole championship layout. The Old Nine is the estate's first course, a 9-hole layout featuring tree-lined fairways. Click and drag on the map below to explore the course, or use the controls on the map to zoom in and out.